Shampoo is manufactured in four modifications: for long-haired dogs and cats, wire-haired dogs and short-haired cats. 180 ml (for cats) and 270 ml (for dogs) polymeric bottles. Stimulates metabolic processes in skin and hair roots. Provides silky and shiny hair. Thickens hair and flats its squamosal layer. SEA shampoos contain chitosan (unique natural polysaccharide derived from king crab carapaces). It is an excellent natural conditioner. Chitosan forms moisture-holding cover. Due to this fact, it moisturizes skin and hair, protects from environmental aggressive factors and increases UV tolerance. Chitosan is absolutely nontoxic. It does not accumulate in hair being safe for extra sensitive skin, also has soft antibacterial effect, removes electrostatic charge, provides hair shine and improves combing. Sea shampoos have attractive odor of sea freshness. It contains chitosan, glycerol and conditioner. The shampoo perfectly washes hair, moisturizes, promotes hair shine and easy combing. It contains chitosan, sorbitol, conditioner and provitamin B5. The shampoo perfectly washes hair, keeps natural wiry hair and promotes hair shine. It contains chitosan, sorbitol and conditioner. It contains chitosan, glycerol and seaweed extracts. The shampoo perfectly washes hair, provides nutriment, moisturizes and repairs natural hair shine. 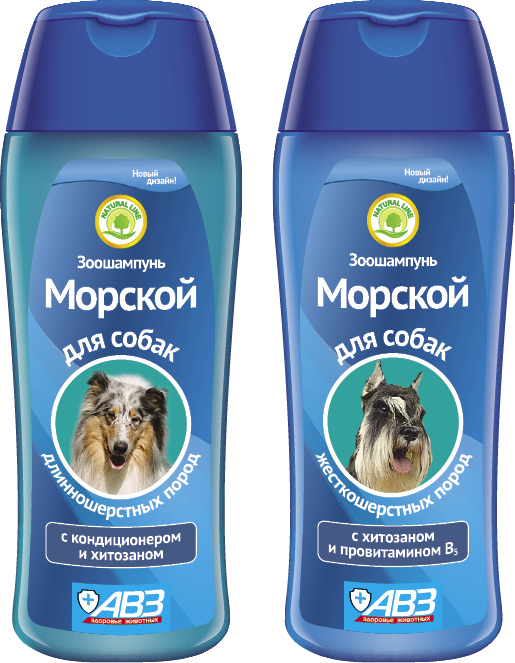 Shampoo is manufactured in four modifications: for long-haired dogs and cats, wire-haired dogs and short-haired cats. 180 ml (for cats) and 270 ml (for dogs) polymeric bottles.